Carlo Gavazzi's CA18 and CA30 CAN/CAF capacitive proximity DC sensors feature several significant upgrades from its previous sensors, including superior electromagnetic immunity and refined sensitivity adjustment with stability indication. 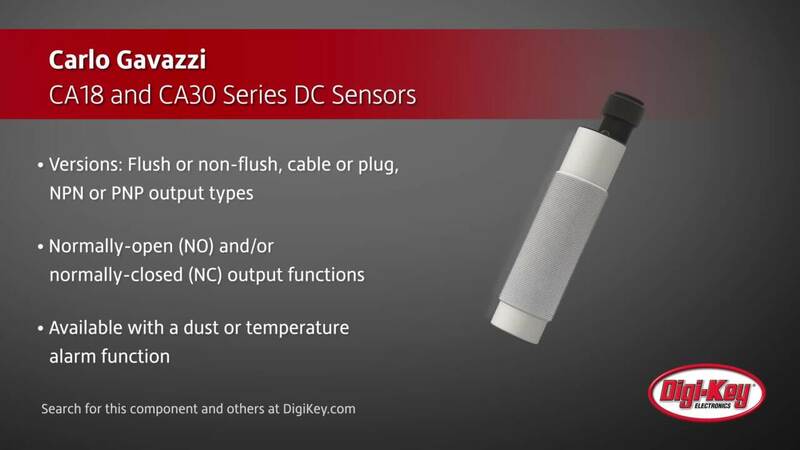 The sensors come in flush or non-flush, cable or plug versions, with NPN or PNP output types and NO and/or NC output functions. They are available with a dust or temperature alarm function. Featuring an ECOLAB certified sensor housing rated to IP69K standard, these sensors are exceptionally well suited for reliable detection in environments subject to high temperatures, harsh chemicals, steam, and high-pressure cleaning. The CA18 and CA30 CAN/CAF sensors are ideal for a wide range of applications that require dependable measurements or monitoring of solid material or fluids.